Choose Day – Deciding a day is most important part of planning Lonavala Sightseeing. 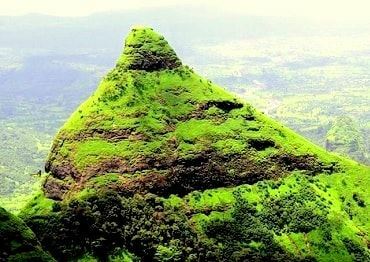 Many people thinks, a weekend is a best for Lonavala sightseeing. By considering crowd and traffic, weekend it is not a good choice. Decide non-weekend days to visit Lonavala, as it will reduce your cost. Generally, Tuesday to Friday and sometimes Saturday is best days to visit. In Rainy season you can skip Saturday also. Choose Number of Days – Day count directly affects the budget of trip. Each day may increase your food, staying and traveling cost. If you have already fixed your budget, then choose days accordingly. You can even re-arrange your budget by reading this information. As Lonavala is a small town, you will save your traveling time as much as possible. Choosing Places – It depends on how many days or hour you are staying. If you are planning a half day trip, then following places are best. 1) Lions Point 2) Bhushi Dam 3) Lonavala Lake 4) Shooting View Point 5) Rajmachi Garden 6) Waghjai Mata Temple 7) Duke Nose Point 8) Monkey Point. If You are planning a whole day trip, then you can add following places with above in your plan 1) Karla Caves 2) Bhaje Caves 3) Lohgad 4) Pawnee Lake. You can extend this trip to 2 days also according to time availabiltyIf you are planning to 7-day trip, then you can add following places to above. 1) Rajmachi Fort 2) Tung Fort 3) Tail Bail Fort 4) Duke Nose 5) Kunegaon Waterfall (only in monsoon). 6) Korai Fort. You can also visit Narayani Dham, Wax Museum. 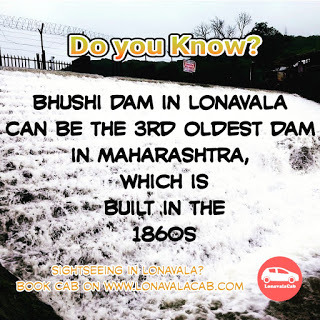 Unfortunately, there is no any standard cab service available in Lonavala, Lonavala has only one of its own cab services i.e LonavalaCab. If you are planning to reach by Train then lots of trains are also available from Pune and Mumbai. You can find exact train time table from government site i.e http://www.indianrail.gov.in. Taking precautions – Avoiding the things that can be dangerous for and your friends. 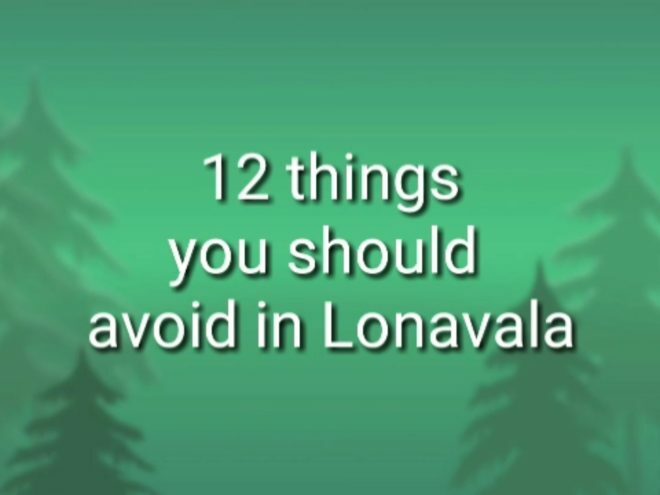 1) Overtaking in heavy rainfall and fog 2) Parking vehicles at turns 3) Driving a vehicle after alcohol consumption 4) Diving in water without knowing deepness 5) Staying below the waterfall without knowing water force 6) Swimming in inappropriate clothes 7) Walking carelessly on slippery area 8) Roaming in the jungle at late night 9) Unnecessary dare like sitting on mountain peak 10) Taking selfies carelessly at inappropriate places 11) Throwing plastic and glass waste 12) Racing or driving vehicle fast. Know Lonavala Specialty – Chikki, Fudge, Vada pav, Homemade food, Jelly and much more things you can enjoy in Lonavala. Hundreds of varieties are available for Chikki, you can choose any one according to your taste. You can also visit the manufacturing units of the these. Chocolate, mango and many famous flavors are available to try. There are many artists who writes your name on rice seed, you can also try this. Skip Places – You can skip Ryewood Park and other Parks according to traffic conditions. As traffic and monsoon cannot be predicted you can skip Lonavala lake. Most of the people stuck here in traffic. This traffic is mainly present on weekends. Skip hotels that are too far from the main town if your budget is low. It will cost you more for traveling. Reducing Travel time -It is always better to reduce traveling. In Lonavala, you will also enjoy the traveling, as many views can be seen while traveling. Do not skip one point to another, it may be tempting to revisit the point. Every point has specialty, so don’t miss any in that round. Arrange your journey in such a way that the distance will be less, and maximum points will get covered. 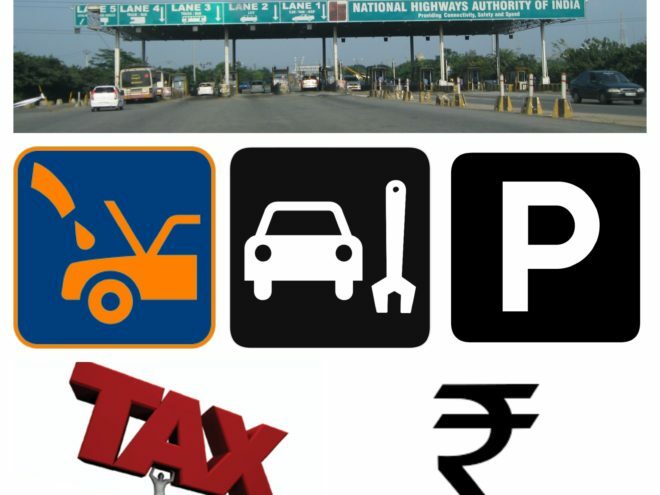 Planning Return journey – Take care of the return journey plan. If you will find any difficulty after a trip you can ruin your memories. Always make arrangement of return journey in a better way as it is also part of your trip. Next: Why cab charges vary?